Fall is in full swing so you know what that means — time for fall cocktails! The fall time brings about so many great activities like pumpkin carving, hay rides, corn mazes and a traditional favorite, apple picking. When thinking about what drinks you want to enjoy or make for a party, try incorporating the flavors that are prevalent among this season and the activities that come with it! The October signature cocktail is an Autumn Smash. This drink has some fresh fall flavors that will be sure to pack a punch. It may seem complex being that there are some unique ingredients in this cocktail, but it is super easy to make and the flavors all work together deliciously! Check out the recipe below. 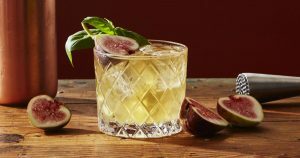 Start off by muddling the fig and Thai basil leaves in a shaker. Add the lemon juice, maple syrup, apple juice, vodka and some ice. Shake until the shaker is very cold to the touch. Strain into a glass full of ice and garnish with a touch of basil! The Autumn Smash will be featured as the signature cocktail at our 2nd Annual Fall Festival on October 18th so be sure to come by and give it a try! *Tip – Take this cocktail to the next level by replacing the apple juice with apple cider! Apple cider has a richer taste and is a classic fall staple so it will be sure to impress.